At this time it is grouped in small flocks, in order to successfully make raids on concentrations of fish trivia. On snag or rocky edge fishing can be very successful. But not so simple. Caught my friend in the autumn morning in the upper part of the Ruzsky reservoir, near fishing camps Ostashevo. Even at home I have prepared well for the hunt for the fanged predator, was replaced by snastochki tees, believing that the hooks of vanadium steel would be more reliable, produced a dozen soft silicone twisters and fish cargoes-heads weighing 8-20 g. it was in my Arsenal and other baits. The boat anchored about fifty meters from each other, opposite of dry wood on the opposite Bank is a landmark mate. On the third transaction I have a dull hook. Trying to free the bait. Useless. Will have to come closer and to take off. — What happened? You got a problem? — Yes, by the way, I forgot to tell you, this place snags Nemer — zeugnisse buddy. — So, put nezatseplyayki. And here’s the first bite. Pike perch under a kilogram took on a yellow Twister-scallop in the uncoupled case (see photo). It was a lot more fun and three hours of the morning, each had a few fangs. Experience shows that perches suburban reservoirs in early autumn, not yet slipping into winter encampments as forage fish continues to “graze” on the overgrown shallow waters, but with the dieback of aquatic vegetation it shifts to the deeper parts. For flocks of small fish followed by the predators. On arrival at the pond the first thing that comes to mind is, where to find at least a small cluster of Sudakov and anchor. In fact, how to navigate among a vast water area and the many differences in depth. Well, if you regularly visit the same reservoir. In this case, you well-known traditional sites fanged depending on the season and hours of their release for feeding. Otherwise you’ll have to take into account the main factors of location Zander packs. So, if in summer, especially in clear weather, day perches are resting at a considerable depth (up to 10 m or more), leaving to feed in shallow areas at night and twilight, in autumn, the situation is somewhat different. Autumn Zander, overfed, over the summer, with cold water rarely goes hunting, what’s more, generally can abstain from food for several days. However, this does not mean that he will ignore a tempting bait, approached him. And periodic abstinence in the diet may explain the exceptionally slow metabolism in the body. The next factor — the presence of the bottom cover, where the predators are waiting for their victims and feel (instinctively) more secure. The number of Zander stops depends on the number of such shelters. This is usually rocky or snag predoslovie the edge of the deep-sea areas before the dams and dykes. To the prospective places as well as submarine elevations — “the navel”. To study the bottom topography is best with the help of sonar, followed by the entry of efficient points on homemade cards. I, for example, for several years on the Istra reservoir with one and the same point almost always took autumn perch. And I noticed a characteristic in their behavior: in cloudy weather and with a drizzle fanged predators were more active than on clear days when the bite stopped, usually immediately after sunrise. Experienced angler-sugacity in as the method of “spear” to find efficient points and efficient to catch a throw to an effective lure. For the fall walleye can successfully use a soft bait, spoon lures, crankbaits deep, snastochki with a dead fish and some other baits. The main thing that they worked in each case. I, for example, in recent years increasingly prefer silicone twisters and vibrohvost. Cheap and cheerful. All currently available spinning lures made of soft plastic and silicone can be divided primarily into two large groups: active and passive. The first is lure, which at the time of posting squirm or seductive povelivaet tail. The second require the angler to have certain skills and abilities to give them the desired game. Such lures are often used when speed transaction. The most dynamic and active soft bait is twisters and vibrohvost. You can use them on jig heads and cargo-heads with conventional and offset single hooks, doubles and trebles, as well as an additional leash in various combinations with spinners, wobblers, foam fish and other baits. On a jig-head Twister is mounted in such a way that the tip of the hook was located approximately in the middle. I prefer the “eared” load-heads, to which Twister on single or double hook fastened by means of a clockwork ring. In this case, the bait plays more freely and naturally becomes more attractive to walleye. Vibrohvost also works great at any speed posting, attractive poilevaya tail from even the slightest movement of the water or during a free fall to the bottom. Of particular interest are samoopredelenie soft bait. They can to some degree be attributed to the family of balancers, except that instead of tail rudders they have the blade of a shad, which at the time of free fall bait seductive vibrate, attracting fanged predator with a pretty decent distance. 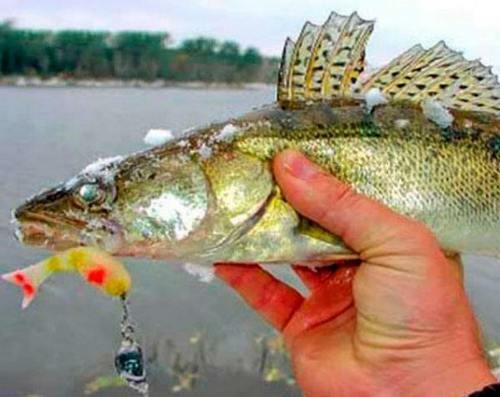 I would like to draw attention to the fact that for walleye you need to carefully checked tackle. The rod better to use a fast system, and as fishing line — braid. The reason is that this predator is quite hard to fall and to get a feel for crochet it is not easy. In any case, when playing big predator should not force things, if you don’t want it full of vigor and vitality, broke the line or got off the hook at the last moment. It is impossible to forget that deep sea perch when entering the upper water layers, is experiencing a terrible discomfort. Once I caught Fang in the upper part of the ozerninskoe reservoir. To the left of the boat was a picturesque deciduous forest beginning to turn yellow birches, and ahead of the rate of snag Bay, the bottom of which held a small stream bed. The place was fancy, and I decided to anchor. On the first throw foam fish-nezatseplyayki was followed by a decisive and strong grip of a predator. Fifteen minutes I tried to wear him down and bring to the surface, but he stubbornly resisted. Finally managed to bring the boat meter agacino and I have felt for a landing net as the predator whirled and freed from the lure. It was a very instructive lesson. Concerning the perch there is a widespread belief that he is lazy. This is explained partly by the fact that his bite with a step-transaction, often weakly expressed. And in the ordinary transaction in the first second it is sometimes difficult to determine that the hook — fish or a tuft of grass. And only when the pike are mixed in the scene, you know who you are dealing with. Perch-like fish demersal and deepwater, it would seem less suited for fishing with twin bait. However, hunting perch — quite playful and aggressive predator with a strong sense of rivalry. And, of course, well-chosen tandem baits in this case can give an unexpected effect. I could cite many examples in favor sudakevich tandems, the formation of which can be manifold: oscillating spinner + spinner; vibrohvost + Twister; two urasaki, etc. In previous years, for example, when fishing for autumn pike perch I often used snastochki with a dead fish. Then by itself switched to “foam” and jig baits. Thus have saved yourself from having to stock up on puskarini, roaches there or pipe cleaners and were quite satisfied. But this is not always arranged perch. Once arriving at the fishing base in Ostashevo (Ruza reservoir), I learned from fishermen kruzhochnikov that the perch takes mostly on live bait, but the bite is very weak. After 1.5 hours of morning catching the “grind” on porolono the one and only pike-perch weighing about a kilogram, we decided to experiment with tandems, which he changed after every 10-15 casts. The turn snastochki with minnow, just ahead of the lure I put a homemade rotating spinner with a yellow petal. It is this tandem and then brought me three nice perch. And the result is, as always, speaks more eloquently than any theoretical research. When selecting tandem rigs for walleye, in my opinion, it is preferable to use a two-color spinner (brushed silver, yellow brass) and yellow, orange or red twisters with neon sequins. Now many firms offer fans the walleye fishing is very efficient silicone bait, especially made of Japanese “rubber”. They can be used both in combat and in the uncoupled version, which is very important when fishing in strong places. But it also happens that all the proposed walleye artificial lures from your collection do not work, especially in the daytime. In this situation you can get natural. When fishing for them remember a few basic rules that often allow to move away from zero. 1.Try to offer the perches snastochki with fresh fish (bleak, roach, gudgeon). It is likely that it will be possible to call the fed and phlegmatic predator on the grip. It is useful in this case to apply not one, but two hooks in snastochki. One hook is fixed at the head of the fish, and the other in the tail. 2.Use the right rig, designed for deep-sea fishing. When catch at great depth, light snap be not efficient, as it is important to do the wiring above the bottom. The light lure (without shipping) will reach it too slowly, and to manage it is not possible. For the weighting of the snap-in should use a sinker or a special deep trolling systems weighing up to 30 g — water tanks that is enough. This is the same Tyrolean wand, circa on the bottom and kicking up a cloud of turbidity, attracts the predator. By properly selected the sinker, the line will be at the time of posting tightly stretched that allows you to notice even a weak bite. Rigging natural baits might look as follows. The first hook on 15-inch leash is approximately 40 cm above the sinker, the second hook on the same leash spaced from the first 40-50 cm as baits uses a narrow fish with a length of 7-12 cm, they are usually must be mounted on single hooks No. 2/0 or tees. Sometimes a good effect gives the application of cutting (pieces of fish), the Nightcrawlers, linuxero cancer. 3.Don’t forget that the majority of bites Zander on a moving bait. With shallows in depth guide it slowly, in windy weather keep the boat in free drift, making casting with the casting, and finding Zander pack, anchor and without undue haste continue fishing.